Judas Priest: Eastern Facts Unleashed! On September 17, 1979, Judas Priest released Unleashed In The East. Here are the essential facts you need to know about the album. Amaze your pals! * There has always been speculation as to how much of the album was recorded live, and how much overdubbing was done in the studio. 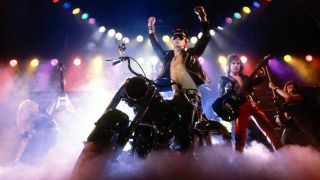 Rob Halford has admitted that he was suffering from flu when these shows happened, and this ruined his vocals. Consequently, he redid his parts in the studio. * The album is also known by the ‘affectionate’ title of Unleashed In The Studio, because of the above! * It was the first Priest album to be produced by Tom Allom. Subsequently, he worked on all their albums up until 1988’s Ram It Down. * This was also the first Priest album to make the UK Top 10 – peaking at number 10 – and the US Top 100, making it to number 70. * Unleashed… was the debut Priest live album, and the biggest seller of their five live releases so far. * The original Japanese version of the album came with a bonus seven inch EP. This had the tracks Rock Forever, Hell Bent For Leather, Delivering The Goods and Starbreaker. The 2001 CD reissue featured all 13 tracks. * Despite being recorded around the Killing Machine album, only two songs from the original Unleashed In The East came from that album: Green Manalishi (With The Two Pronged Crown) and Running Wild. * Priest did six live shows on their 1979 Japanese tour. This world tour began in London, on October 23. 1978. It ended in Nice on December 15, 1979. * The band’s set at the two shows recorded for this album were actually 17 songs long. * The first song the band played on the opening date of this lengthy global tour was White Heat, Red Hot. The last song played on the final date was Starbreaker.